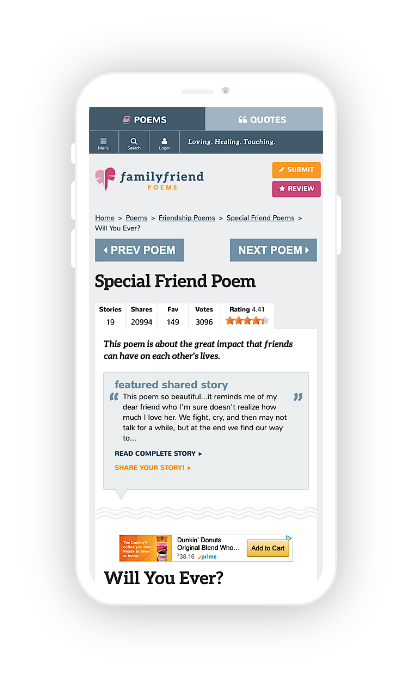 Family Friend Poems provides a curated, safe haven to read and share touching poems and stories that help heal and offer catharsis through good times and bad. At first, I was brought in for a mobile-friendly design “refresh” to catch up to Google’s mobile-rank signal. But in order to achieve their ultimate goal of increased site visitors, a full brand discovery and UX strategy was needed for long-term success. 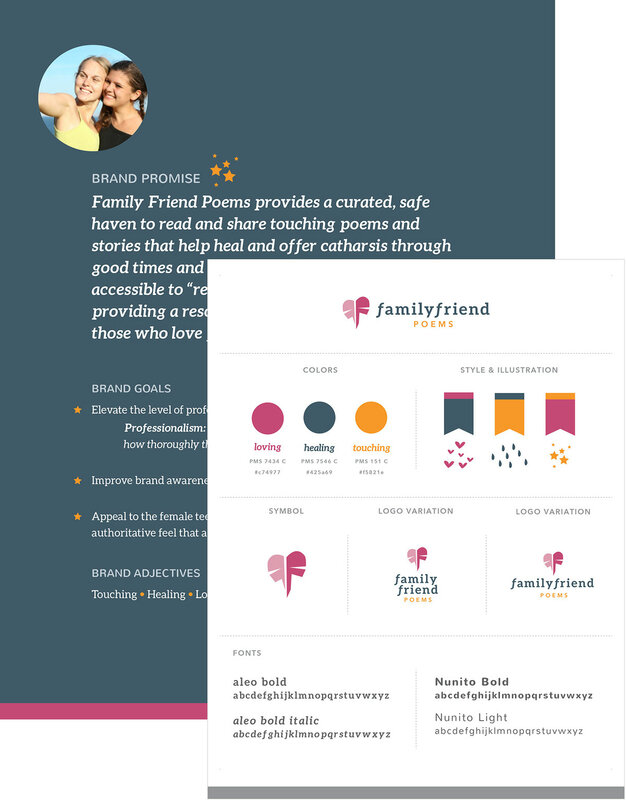 Once research and discovery was complete, I provided design and art direction for Family Friend Poem’s website and social media, then created templates plus brand and style guidelines for staff to follow. Staying in business every year is a testament to the quality and usefulness of your work and recommendations. The primary business objective was to generate better ad revenue through increased site visitors. However, his site wasn’t mobile-friendly so SEO ranking could drop. 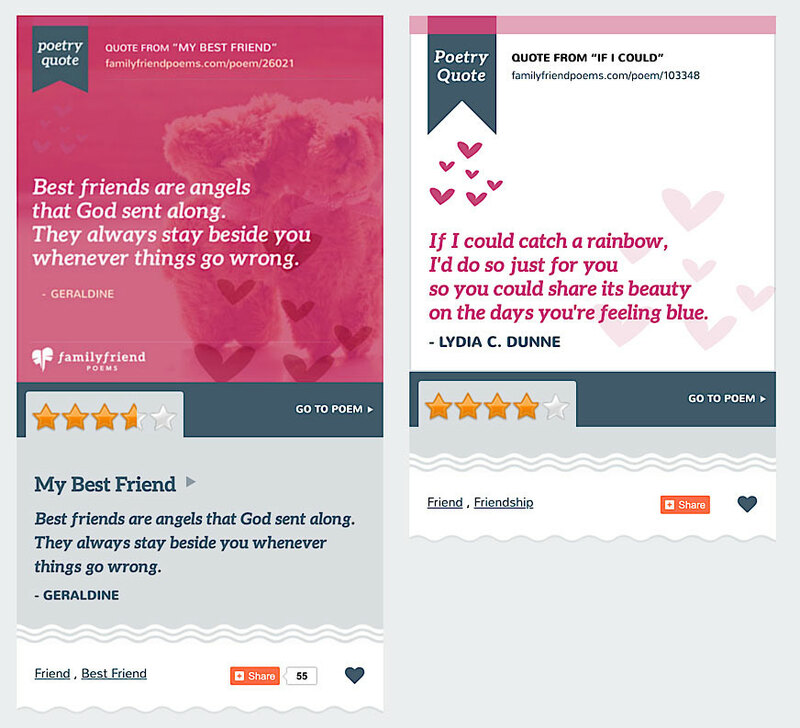 Plus, to push further user engagement, a new poetry quote section needed to be designed and launched. But that, also, had its issues: site speed is a mobile ranking signal. 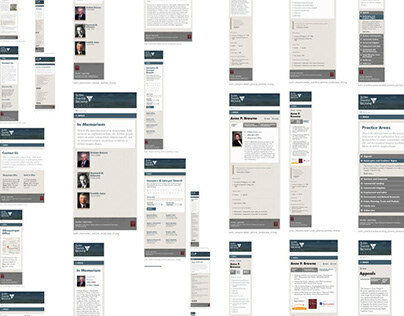 How could we do that when he wanted to launch an image-heavy quote section for this site? 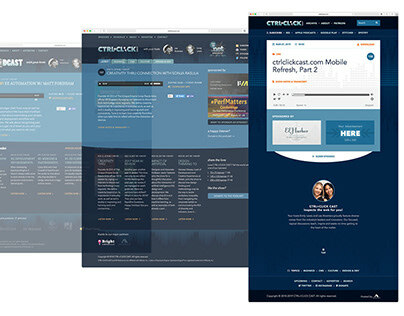 Finally, the site was looking dated, was hard to navigate, and didn’t have anything that set it apart from its competitors who were modernizing their own sites. Before we could increase traffic and therefore increase ad revenue, I had to thoroughly understand where my client was coming from. Prior to our engagement, Family Friend Poems did not have brand direction or distinct style. After our research and discussions, it was clear that in order to make a statement and provide a better user experience, we needed to craft an identity and brand that appealed to their primary audience of young teenage girls. The result is a fun, cohesive design system with clear rules, templates and modules — for all digital properties including web, social media, and Android app design. My client's team is empowered to create new pages, content and assets by simply referencing the Simplified Brand Guidelines and the UX strategy outlined, alongside the the style guide I helped set up with teammate Emily Lewis. In fact, simply by referencing these documents, they were able to successfully create and launch an Android app all internally! After thorough research and discovery, it was clear that in order to appeal to the primarily teen audience and keep them engaged, we needed to remove generic CTAs that focus only on adding comments. 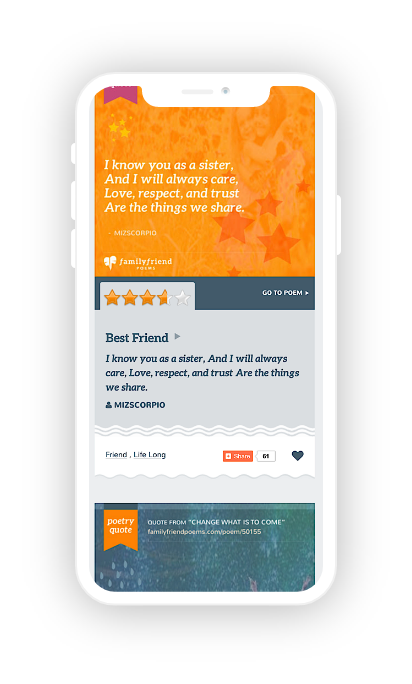 Here, we focus on users sharing their stories and how this poem resonates with them personally. 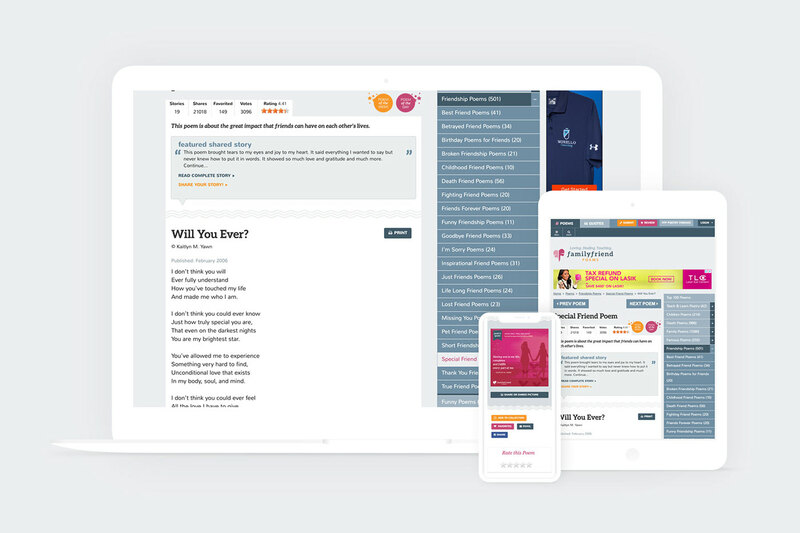 While I was not initially contracted to do copywriting for this site, in order to convey my ideas to the client as to how to execute some of my UX and brand strategies (as well as design in context! ), I wrote pieces of copy that he ended up using to this day! In order to maximize shareable quote SEO (and accessibility), I created a container that allowed the image to be shared with in-browser selectable text below (shown on the left). However, to maximize speed and flexibility, I created styles and containers that was 90% HTML/CSS with minimal graphics (e.g. pattern backgrounds) so quotes can be generated without needing to always make an image. The site continues to enjoy over a 1.6 million visitors per month. 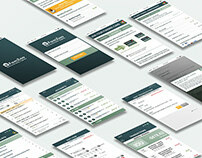 There was a 25% jump in mobile users after the mobile-friendly responsive redesign was launched! Next, our actionable suggestions in the brand guidelines propelled his social media engagement to the next level: a 400,000 increase in Facebook likes within one year. This is significant considering that his first 100,000 likes took four years to build. I learned all about Google Ads and its restrictions, as well as how much, speed and performance really affect not only the primary user experience of poetry consumers, but for Google page rank. During the research process, it was interesting to see my client showcase a lot of understanding about the general audience but little about the motivation of that audience and how to appeal to them. Reviewing Family Friend Poems’ social media engagement provided an interesting insight to exactly why they visit the site. The most challenging part of the project was balancing the sheer volume of content along the user priorities and intended actions. Then we had to make sure the ad experience was responsive, fit well, and looked good! Collaborating with the client, educating ourselves on Google Ads as well as developer insight on responsive techniques allowed us to prioritize the display on the page while keeping poetry heavily in the forefront for the main audience. The brand guidelines provides a daily reference for Aaron and his staff to use to make business decisions: financial, marketing, and more! In addition, the style guide and patterns we established empowered his team to create whole new pages and sections by themselves. In fact, our style and brand guidelines allowed them to build their own Android app based on the rules we set alone. 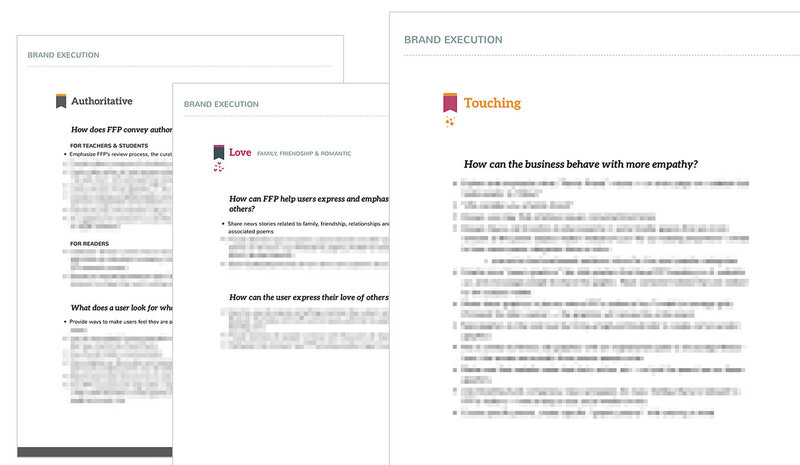 I really enjoyed providing actionable insights that the brand discovery uncovered. 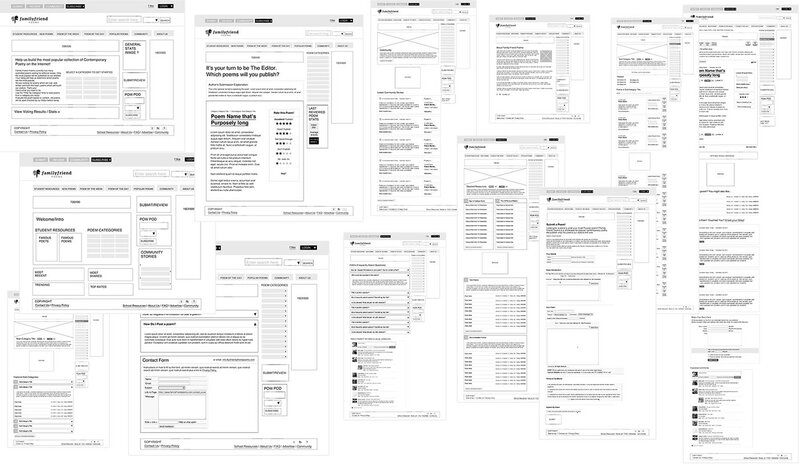 It’s important to note that design decisions aren’t limited to look-and-feel. User experience goes beyond just the screen so it feels good that all our work provides the foundation for a successful business.